Two Washington engaged couples will leave here Monday for extended bridal trips to Seoul, Korea, and a wedding in October in which 698 other couples will also be united in wedlock. The wedding, apparently one of the largest mass marriage rites ever, is to be conducted by Sun M. Moon, the Korean founder and leader of an international religious movement known as the Unified Family. 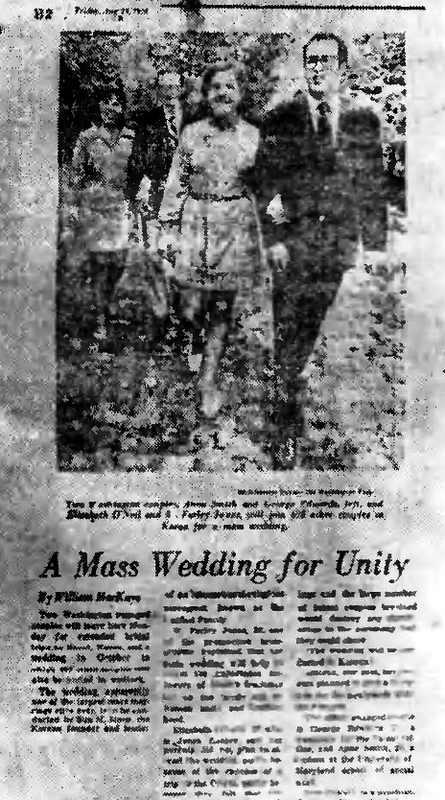 W. Farley Jones, 27, one of the prospective bridegrooms, explained that the mass wedding will help to stress the importance followers of Moon's teachings lay on the family and on human unity and brotherhood. Elizabeth O'Neil, 27, who is Jones' fiancée, said her parents did not plan to attend the wedding, partly because of the expense of a trip to the Orient partly because they felt that the strangeness of the surroundings and the large number of bridal couples involved would destroy any significance to the ceremony that they could share. Instead, she said, her parents planned to give a reception for the newlyweds after their return. The other engaged couple is George Edwards, 31, a translator for the Patent Office, and Anne Smith, 27, a student at the University of Maryland School of Social Work. Miss O'Neil is a psychiatric nurse, Jones a teacher.